​Arsenal and Manchester City remain locked within a point of each other at the top of the Women's Super League table, with only a few tense weeks of the 2018/19 season left to play. But both sides left it late to emerge victorious in their respective fixtures over the weekend. 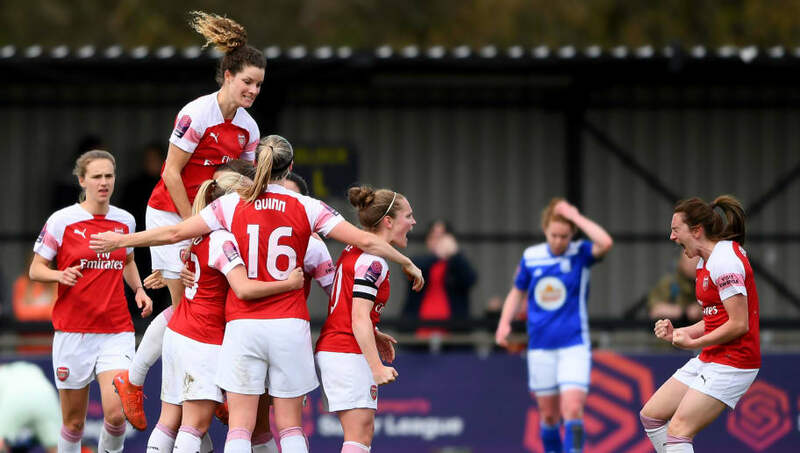 Despite scoring 62 goals in their first 16 WSL games of the season, Arsenal couldn't find the breakthrough against a resilient Birmingham side until the 79th minute. The Gunners had gone close a number of times, but Katie McCabe's solitary strike was the only difference. That result ensured Arsenal remain at the top of the table, although hopes that the slim lead would be extended to four points were dashed when City scored a 95th minute winner against Liverpool. Liverpool have had a difficult and disappointing season, yet threatened to throw a huge spanner in the title race when Courtney Sweetman-Kirk cancelled out an opening goal from City's Claire Emslie to tie the score at 1-1 in the second half. That was how it stayed until Scotland defender Jennifer Beattie managed to find the winner with a header deep into stoppage time. Late drama here at the Academy Stadium as City claim all three points! Arsenal lead by a point and have a game in hand, while the top two will face each other on the last days of the season in May in what could be a climactic title decider. Just days after a fantastic result in France saw them progress to the Champions League semi finals for the second year running, reigning champions Chelsea fell further away from the top two after being held to a 1-1 draw by mid-table West Ham. Beth England scored the opening goal for Chelsea, but it was former player Gilly Flaherty who came back to haunt her old club after netting West Ham's equaliser in the second half. Elsewhere, Yeovil won only their second WSL game of the season to stave off relegation by beating fellow strugglers Everton. Just days after the onset of administration and a cruel 10-point deduction, Megan Alexander scored the only goal of the game in the 77th minute. Now on -3 points, Yeovil can still avoid relegation if they win all four of their remaining games, Everton fail to take any more points this season, and there is enough of a goal difference swing in their favour. It will require nothing short of a miracle. In the only other WSL game over the weekend, Reading secured a narrow 1-0 win over Bristol City, to end a recent run of four consecutive league defeats and take their first points of 2019. Brooke Chaplen scored the goal to put the Royals back into sixth place. The WSL will return later this month, with fixtures on 17, 20 and 21 April.